The first week of school is over, and I’m always surprised about the weight that has lifted from me once I meet all my new students for the semester. It’s a good type of stress, really, but stress nevertheless, and I’m always relieved to get that first week under my belt. Now, comes the hard part. A question that is always discussed on blogs and in columns is how to find the time to write. I admit that I don’t have kids, but I still have a heavy teaching load at a community college, so my full-time job does take a lot of time and energy. This is not a complaint: I love my job and feel very lucky. Still, during the school year, I have to make time to write in a busy schedule and that is not always easy. This semester is going to be especially challenging, because I have a mixed schedule — I’m teaching morning, afternoon, and evening classes and thus my free time is a bit different every day. I used to write early in the mornings, but on some days, I won’t be able to do that. However, this semester, I’m not teaching on Fridays, so I will have my Friday mornings free — which is the first time in all my years of college teaching including my years as an adjunct. Looking at my schedule, I don’t believe having a set time each day is going to work for me. Instead, I’ve been thinking a lot about my Newswriting and Editing course and its syllabus. In my life before a college professor (sometime in there between retail and factory work), I was a reporter for a small town newspaper. As a reporter, I didn’t live by finding time to write — writing was my job. Instead, I lived by deadlines. I’m thinking that may be the way I should approach my writing life in the next few months. Many submission periods and contests have deadlines, and making those deadlines should be a goal for me. Better yet, in my notebook, I plan on setting five writing goals (attainable goals — sometimes I have very lofty goals and then I get upset with myself when I don’t complete them) for each month, and working towards those goals or “making the deadline” a phrase I’m going to use in my Newswriting and Editing course. So, what is my first deadline? Proofread a set of galleys and email an editor about a wayward review. Sounds easy enough, right? 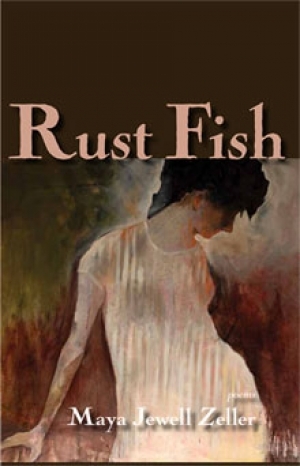 Fans of the Scrapper Poet know that I love coming-of-age poetry books, so I’m happy to add Rust Fish by Maya Jewell Zeller to my collection. Zeller’s debut book tells the story of a girl growing up in the working-class world of the Pacific Northwest. Using narrative poems that often invoke a strong sense of place, Zeller recounts the uncertainty and brutal life of children, while balancing resilience and hope in her stories. Rust Fish is divided into four parts, each part beginning with a poem titled “Rust Fish.” The poems, obviously contain images of fish, a symbol may seem somewhat expected in literature of the Pacific Northwest. Indeed, many of us when we think of this part of the country get the instant mental image of salmon struggling against the current to return to their streams to spawn. Still, the fish found in Zeller’s collection do the unexpected — they are metal decorations that break free at night, fish that long for the moon to bleach them beautiful, or beautiful creatures that can take you to heaven in their gills. Each poem acts as a preface to the section it proceeds, as the reader is guided through the life of a girl who lives a rough and tumble life. Organized in a chronological format, readers follow this young girl as she grows up learning lessons and dreaming what would seem to be impossible dreams, all the while struggling to find a place in this world. In “Goddammit” she explains that they all “learned to swear from our fathers/when they’re chopping wood/and miss the log.” In “She Dreams of Being an Artists” the narrator sees beauty in her breath against the frost on a windowpane.” Certainly, in later poems, the narrator sees a bit of herself in the children in her neighborhood and in her students. Indeed, in “Neighborhood Kids,” the narrator is pleased when some little boys want the tomatoes from her garden until she learns, at the end of the poem, that they aren’t eating them, but using them as balls and hitting them with their baseball bats. Rust Fish is a delightful exploration of how sense of place intertwines with story and how we are part of the physical landscape around us. Rugged and beautiful, Zeller’s poetry is not to be missed — for more information, see the poet’s website here. Classes start tomorrow, and I’m excited for the new semester to begin! Of course, this week will bring the stress of the usual first days of the semester including copier breakdowns, lost students, and class roster anxieties (between advising and teaching, I will meet over 200 students this week, and by the end of the week it will seem that most of my students are named Ashley, Brittany, or Michael). Once this week is over, the semester will fall into a somewhat settled routine, where I can find my office computer beneath the stray registration slips and copies of syllabi, and I can catch up on emails and course lecture material. This week I’m back to JCC, so while I realize that the summer season is far from being over, my summer is winding down to an end. This past week I said goodbye to Gregory DeCinque, who has retired after 19 years as President of Jamestown Community College. I have been at JCC since 2001 and I will always be thankful for Greg and the JCC Community in general for giving a young, new faculty member (Obviously, I’m not young or new anymore!) a chance! I’m also slowly saying goodbye to the summer by scrambling a bit with my own writing. It’s true that I haven’t drafted a lot of new poems this summer, but I have started many, many prose pieces that I wanted to revise and send out. And I did — two short stories, one work of creative nonfiction, and even some poems from last April that never made any kind of journey to the published world. I know a lot of writers save their material for a big September (when many journals open their doors) event, but the start of the Fall semester is always too busy for me to even consider doing much with my own writing. Here’s to the remaining days of summer and let’s hope we will continue with the beautiful weather! For the past few years, the editors at the Crab Orchard Review have been publishing theme issues dedicated to various regions of the United States. This fall they are seeking submissions for writing that explores “the people, places, history, and changes shaping these U.S. States, Commonwealths, and Territories: California, Oregon, Washington, Alaska, Hawai’i, Puerto Rico, American Samoa, Guam, the Northern Mariana Islands, the United States Virgin Islands, and other areas which have been a part of the United States beyond the Lower 48 States (excepting those States listed here).” The submission window is August 15, 2013 through October 1, 2013. Check the journal’s website for complete guidelines. Newpages has recently introduced me to their Undergraduate Literary Magazine Resource, and as a professor I am very happy for this link. In my creative writing course, I drag all my old copies of lit journals and magazines to the classroom to talk about publishing and introduce my students to online literary journals in our computer labs, but I have to admit that I don’t have a lot of information about undergraduate journals, and this is a great resource. I also have to admit that I took a quick trip down memory lane while examining the list. One of my first publications, ever, was in Seton Hill’s literary journal Eye Contact which is on this site. I was a senior at Pitt Greensburg, basking in the knowledge that working-class poetry existed and that I could be part of this canon — especially when Eye Contact selected my poem, “The Girls on Third Shift” for publication. Afterwards, I discovered literary markets that did take my factory poems (5 AM, Anti-, Labor, and the minnesota review — just to name a few), but I will always be thankful for the editors at Eye Contact for taking that first poem. Sadly, it looks like the journal has not updated its website in a while, so I hope that doesn’t mean that the journal is on permanent hiatus. This Sunday, I will be taking part in Chautauqua’s The Authors Among Us program, an event that is designed to celebrate writers who have taken classes from the Writers’ Center at Chautauqua. Since there are many of us involved in this program, I will only be reading one poem from Wearing Heels in the Rust Belt, but I will be selling copies. If you are on the Chautauqua grounds, stop by the Literary Arts Ballroom from 2 pm – 3 pm. Then stay to listen to the writers of the week: Poet Mary Slechta and Prose writer Nancy McCabe. We are in the Dog Days of summer here in Pennsylvania — so named because late summer is usually filled with hot and sultry days. Growing up in a pet filled household, I always thought that the Dog Days were so named because our pets would sulk and mope in the heat. Nope — there’s a different history to the name — or at least Wikipedia says so! But the weather has been pleasant and the nights have been cool. Other people may complain about this weather — but I love it! I’m not a hot weather person at all. So, it’s that time of year, and I won’t dwell on what I got done and didn’t get done this past summer. Instead, I’m looking forward to the remaining days of my summer vacation and then, moving on to my Fall Semester. Besides teaching a course I haven’t taught in over seven years (Newswriting and Editing), I have other projects lined up! I will be teaching another fiction writing course at our local library, and I also will be giving a brief talk about poetic form to a group of local high school teachers. It’s this fierceness — both in language and in characterization that shines in this book, which chronicles Jakiela’s return to her hometown after living in New York City for seven years while working as a flight attendant. On the home front, she takes care of her dying mother, struggles to find herself as a writer, and finds love that begins a new part of her life as both a wife and a mother. Sometimes, he’ll come and get me to play too. “My old grandma, ” he’ll say. “She wants to talk to you. He’ll say, “My old grandma’s on the phone. 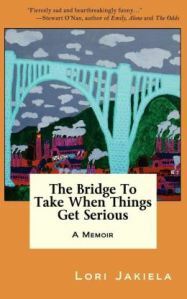 The Bridge To Take When Things Get Serious is an exploration of loss and grief, but it’s also an exploration of what it takes to move on after someone who has always been part of your life is gone. Indeed, Jakiela quotes a friend in her memoir, a wise friend who says, “When you lose your mother, you have to remake yourself.” I lost my own mother over five years ago, I think about this line a lot — what parts of me disappeared when my mother died? How have I changed? How I have not changed and why? How have I remade myself? Jakiela’s answer to her friend, one she records for the reader is this: “I can’t understand this. I never want to understand this.” And we watch as Jakiela is forced to understand her loss and move on with her own life. For more information about this book (and other work by Jakiela) visit Lori Jakiela’s blog/website.